XTide is an open-source program that predicts tide heights and current speeds for hundreds of tide and current stations around the United States. It can be used to produce tide predictions in the past and future for a site at your chosen interval (down to the minute), as well as producing sunrise and sunset times, moon phases, and times when the tide level passes a chosen level mark. 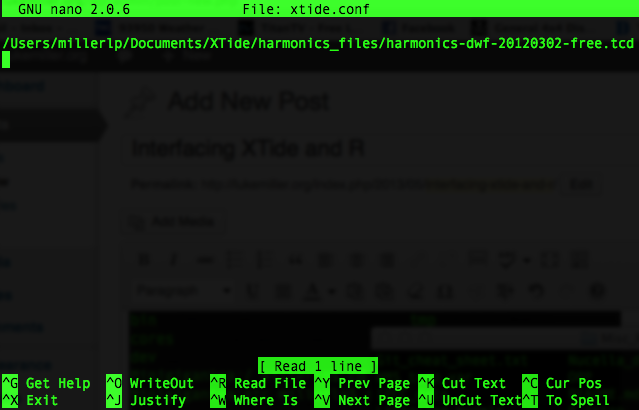 It has a user-friendly GUI version (xtide.exe), but also comes in a command line version (tide.exe) that can be interfaced with other programs like R.
Getting R and XTide to talk to each other is a matter of producing a command line query to pass from R to XTide, and then using R to parse the results into a handy format for further manipulation. I have put together an example script that walks through the process, and shows how to parse the results into a data frame with time stamps. The script, xtide_interface.R, is available in this GitHub repository. # several different examples outlined below. # the XTide site and installed. It is a standalone program, separate from R.
# harmonics.tcd file in the same directory as tide.exe. # time zones and need to standardize on one time zone. # using the current system time zone. # the tide crosses the +2.0ft level. (High/low tides are always included). # Calculate time between each event. # all in UTC timezone, for your site. Height units are meters. # in UTC time zone, units of meters. The interface between R and XTide is the easy part. The hard part is getting XTide properly installed on your computer. Oddly enough, this is one of those cases where the Windows version (download link) might actually be easier than the Mac install, since the Mac version only seems to exist as source code that must be built via the command line (found on this page, someone point me to a pre-rolled Mac binary please). To build from source you need both the xtide source and libtcd source. In either case, on Windows, Mac, or Linux, you also need to download a harmonics file (download link) . On Windows, after installing the binary XTide file, it’s probably easiest to just put the unzipped harmonics .tcd file in the same directory where you installed XTide (where xtide.exe and tide.exe are found). You also need to edit the Windows environmental variable PATH to include the path to the folder where xtide.exe and tide.exe are installed (see here for an example dealing with Matlab). On Mac/Linux, it’s easiest to create a xtide.conf file in the /etc directory found inside the system root directory. The screenshot below shows the process of getting to the /etc directory and starting the nano editor to create the xtide.conf file. Navigating to the /etc folder on the Mac. In nano, on the very first line, enter the path to your harmonics .tcd file. Then hit Control+O, Control+X to save and exit nano. An example of the path to the harmonics .tcd file that goes on the first line of the xtide.conf file. Change your path to suit wherever your harmonics file ended up. If you got Xtide properly built from source, the xtide.conf file should get it working by helping XTide find the harmonics file. The installation pages for XTide reference the export HFILE_PAGE=…. prior to building the source files, but I didn’t have any success with that method. The xtide.conf method finally got things working for me on the Mac. tide -l "Bodega Harbor entrance, California"
and get a string of tide predictions out. If that works in your system terminal, the R script above should work as well, since R is simply calling the tide program via the system shell. Finally, if you’re not interested in predictions for Bodega Harbor and instead want data for your local site, you need to find the XTide name for your site here: http://www.flaterco.com/xtide/locations.html. There are tons of sites there, so use Ctrl+F or Command+F to use your browser’s find function to search for the name of your local tide station. If your station has some crazy long name on that page, you’ll need to use that same crazy long name (For example, “Dumbarton Highway Bridge, 0.28 nmi. SE of, San Francisco Bay, California Current (25d)”) for the sitename variable.